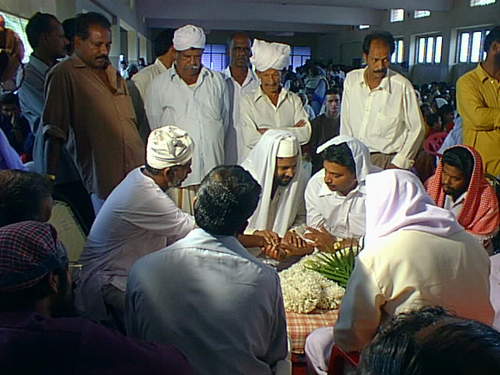 Indian Muslims follow the same pattern in Nikah as followed by the Middle-Eastern Muslims. Before the wedding there are some ceremonies in both the girl's and the groom's house, which is full of singing and dancing, strictly according to the rules laid down in Islam. A henna ceremony is held in the bride's house. There is no rule which says that the groom has to stay in the brides house after the Nikah. After the wedding there is a big reception, given by the bride's parents to guests from both sides, i.e.the groom's side as well as the bride's side. After the reception the groom's party returns with the bride to the groom's house, if the groom is from the same city. But if the groom is from another city it depends on on the timing of the train or plane which the groom's party will use for the return journey. Or if they have come in their cars it will depend on the groom's family's convenience. The family of the groom also throws a reception to welcome and honour the new bride. This reception is known as dawat-e-walima. This walima occurs one or two days after the wedding. Indian Muslim brides receive gifts form the groom's family known as burri (gold jewels, expensive clothes, money etc.). Muslim weddings in India are celebrated in a grand way, a tradition which has come down from the Moghul rulers and Sultans of medieval India. This second description of Indian Muslim weddings was written by Express India, a Hindu site. Let us know if you feel this is an accurate representation of Indian Muslim customs. The celebration of marriage contract is called nikaah. It is according to Muslim law, simply a civil contract, and its validity does not depend upon any religious ceremony. Though the civil contract is not positively prescribed to be reduced to writing, its validity depends upon the consent of the parties, which is called ijab and qabul. Declaration and acceptance in the presence of two male witnesses and a dower of no less than ten dirhams, to be settled upon the bride. The omission of the settlement does not, however, invalidate the marriage. The Muslim law appoints no specific religious ceremony, nor are any religious rites necessary for the contraction of a valid marriage. In India there is little difference between the rites that are practiced at the marriage ceremonies of the Shias and Sunnis. In all cases the religious ceremony is left entirely to the discretion of the Qazi or person who performs the wedding . Consequently there is no uniformity of ritual. Some Qazis merely recite the Fatihah (the first chapter of the Quran), and the durud or blessing. The most common order of performing the service is that the Qazi, the bridegroom and the bride's attorney, with the witnesses assemble in some convenient place. Arrangements are made as to the amount of dower or mehr. The bridegroom then repeats various lines after the Qazi ending with "qabul, qabul, qabul." After the nikaah the groom is taken to the zenana (ladies' section). At the threshold, he gives money and gifts to the sister of the bride. The groom receives the blessings of the elder women and offers them his salaam or salutations. Dinner is served separately to the ladies and the gentlemen. For the first time, after dinner both the couple are seated together and a dupatta is used to cover their heads while the maulvi encourages them to read some prayers.